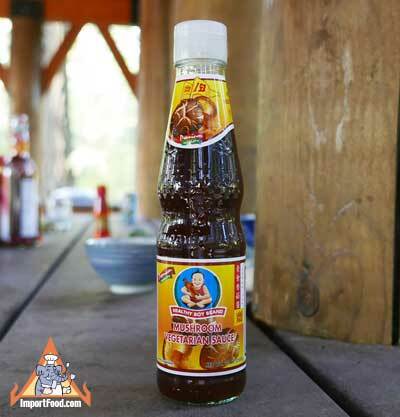 Healthy Boy is the most famous brand of soy sauce in Thailand. They manufacture high quality sauces that fit the Thai recipes, in a modern facility with GMP, HACCP and ISO certification. This is their "vegetarian oyster sauce", just use it as you would oyster sauce. It has the same consistency. Ingredients: water, soy sauce, mushroom extract, sugar, salt, modified starch, glucose syrup, msg, preservative 0.1%. Special Offer: 4 Pack. You get 1 bottle each: sweet soy, thin soy, dark thick, and yellow bean.